I remember having so much to say about my Peace Corps experience 20 years ago. Two years living in another country and everything seemed so different: a new culture, new people to meet, new food to try, new challenges to overcome. I journaled, wrote home weekly, and documented my experience as if I was going to write a book about it someday. Another Peace Corps Volunteer, who was 5-10 years older than myself, dismissed the idea, telling me that I was too young and didn’t have enough life experience to draw on. Those words gave me pause. This pause led to a longer pause and eventually my skipping the idea of writing my PC story all together. Instead, I returned to the States and ‘spoke’ my story as a Peace Corps Recruiter, traveling to college campuses and speaking to interested community groups. Through the stories I shared, I was able to process and reflect on my experience. I was also able to educate others on PC and bond with other Returned Peace Corps Volunteers, listening to their stories. Being a Peace Corps Volunteer may have been the toughest job I ever loved, but being a Peace Corps Recruiter was my favorite stateside job. 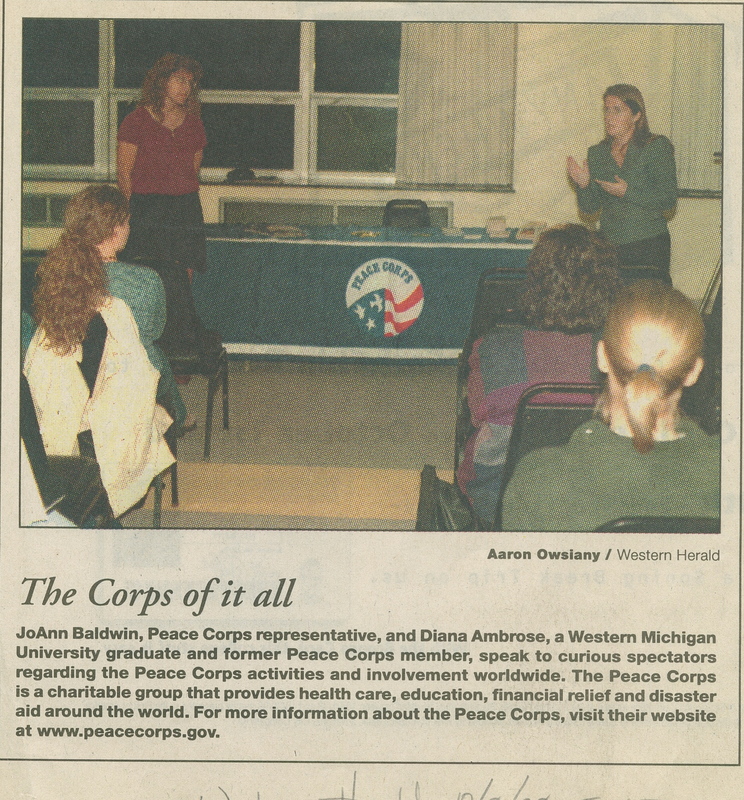 Peace Corps presentation at Western Michigan University. Today’s challenge is to write about my experience with breast cancer–if I didn’t have access to social media. What, no Twitter or Facebook or Google or Word Press? Uh, oh. Thinking about going through the BC experience without all of this social media and ‘virtual’ health that I have at my fingertips today, makes me think of my Peace Corps experience 20 years ago and how I went through that incredibly transformative experience without much in the way of technology. Without social media and medical web sites, following a BC diagnosis, I would have gone in search of information first–which would have landed me at a library, investigating my condition (card catalog anyone?). There might have been a decent mix of brochures and fliers that the American Red Cross would provide when I went to see my surgeon and oncologist, but I would have needed to know more and I wouldn’t have had the plethora of online sources to check out. Just like when I was diagnosed last year, I would have reached out to anyone I knew who had been diagnosed with BC; however, the difference would have been that I would have either made a phone call or written a snail mail letter rather than sending an email or posting to a select group of friends on Facebook. I may have typed group letters on a computer and printed off multiple copies to mail out to inform family and friends of my diagnosis rather than using CaringBridge, but I suspect I would have isolated myself. I don’t think I would have been up to calling many people, but I would have written more in my journal. After treatment ended, when I was looking to answer the ‘now what?’, I would have been journaling a lot. I wouldn’t have found the kind of first hand stories of women (and men) processing their BC experiences that I found this past year in the blogosphere and that would have increased my feelings of isolation. I may have sought a therapist, but when I went looking for support beyond the American Cancer Society’s monthly support groups (would I have even known they exist? )–in the days before blogs and Tweetchats like #BCSM–I would have struggled. I would have looked for the stories of other women struggling with cancer and might have found books like Gilda Radner’s It’s Always Something. Without social media, I wouldn’t have felt a part of a larger, international community. However, without this blog and Facebook and Twitter I just might have written a book about my experience! This entry was posted in Uncategorized and tagged #HAWMC Day 23, Breast Cancer, Peace Corps. Bookmark the permalink. Ywo things—first, you can still write a book about Peace Corps! Second, I have been trying to think of who told you that you could not due to youth and lack of experience! It was someone from Antigua’s EC57 group. I doubt if you ever met her. Who knows, after I write the WWI book about my great-grandparents, I’ll revisit PC. No, never met any EC57 from Antigua. Or would have forgotten if I did! The first book on your list sounds just as fascinating, if not more so, than Peace Corps! !